The most common Meccano part by far, of course. It doesn't bear thinking about how many millions upon millions of these were produced, only to be eaten by the hoover. Meccano nuts and bolts work to a fairly unusual thread pattern, known as 5/32'' Whitworth. The most significant use of these bolts at the time was to attach door knobs to their spindles, which is rather useful to know if you have a house of around that vintage! It was probably chosen as the nearest commonly available mass-produced size that would comfortably fit in the holes governed by the 8swg axle size. Four part numbers are on this page, although one of them is a 'combined' part. Part 37 is a nut and bolt, consisting of a part 37a (nut) and part 37b (bolt). The table above is slightly confusing in this respect, as they were originally referred to in pairs until the 30s, when they started being counted independently. Meccano outfits generally contain a few more nuts than bolts (to allow for lock-nutting). To be absolutely correct, only the 'nut and bolt' existed until around 1912/13, when part 37a (the first part with a suffix) was first mentioned as a part available on its own. It wasn't until around 1920 that part 37b was also mentioned and available for sale. As you can see from the table above, even as late as 1929 outfits were considered to include a number of part 37 and a few extra 37a's. Starting from the beginning of 1973 with the first Multikits, the square nut was replaced by the hexagonal nut, part 37c. Part 37 thus became a part 37c (hex nut) plus a part 37b (bolt), and part 37a was discontinued. Part 37c replaced 37a in all outfits during 1973. Initially, there was only one length of bolt in the Meccano system, around 5/16" (9mm) of thread plus the head. The length was needed because of the thickness of the folded-over MME strips, but caused no end of irritation as two bolts would interfere with each other if both were run into an angle bracket or girder. The earliest ones are easy to identify with a magnet -- they're solid brass and all subsequent Meccano nuts and bolts were plated steel. Finally, in 1919, the first 'long' bolt, the ¾'' part 111, was introduced. In 1922, the new 'short' bolt of 7/32'' was introduced as part number 111b, and somewhere between 1924 and 1926 this took over part number 37 and 37b as the standard size of bolt. Further discussion on this transition between 111b and 37 is described on the Long bolts page here. 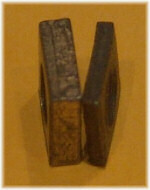 A short-lived 'economy' thin nut was produced during WW1, and the comparison is shown here. These are very weak and as they only hold one thread, difficult to use. They are often found broken in two. The 'standard' brass-plated cheesehead bolt is often thought of as one long-lived part, but there is a distinct difference between the pre-war and post-war varieties. The pre-war has much sharper corners to the head, whereas the post-war is noticeably chamfered. This has one useful side-effect when dating and identifying nuts and bolts: the blackened steel bolts from the Mechanised Army outfits (1939-41) are also sharper edged than the post-war Korean economy (1951-52) and Army Multikit (1973-1977) black bolts. This is a good way of identifying whether nuts and bolts included with a Mechanised Army outfit belong there. There was a change to dome-head bolts in 1929, lasting until 1933 when the cheese-head bolts returned. During the Korean War shortage of brass and steel, economy nuts were made of a lower-grade steel and are not only black but also extremely brittle and break in two when tightened. Nuts and bolts of this period were supplied in boxes and envelopes with a turquoise sticker and broken black band to identify that they are blackened steel parts. Often confused with this part, the set screw (part 69) is shorter and has a much smaller head, but it does come in many of the same variations. 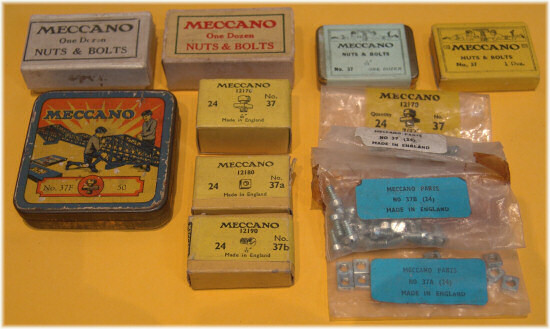 As one of the most critical and losable parts in Meccano, there was always a strong demand for spare nuts and bolts. These were originally in small boxes like the ones top left (dating from around the mid-20s), and then later moved to the small brass-plated tins with paper labels seen top right. 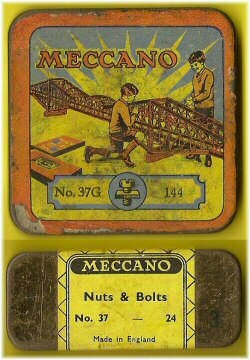 By the end of the 1920s, as well as buying the tins containing a dozen nuts and bolts, there was also a part 37F tin containing 50 nuts and bolts as in the photo above (F stands for fifty), and a 37G containing 144 of each (G standing for gross), shown right. Both of these tins contain dome-head bolts and are therefore likely to be 1929-1932. The photo to the right also shows the immediate post-war spare parts tin of nuts and bolts. Note that they are packed in spare morphine ampoule tins (as manufactured by the Meccano factory during the war), and have pre-war cross-hatching on the labels but post-war "Made in England" printed on them. After this, the standard boxes take over, and now nuts and bolts are available in boxes of two dozen at a time, and also individually as parts 37a and 37b (centre of picture). These continued into plastic bags in the 60s and 70s with various labels. Both the blue label and white label bags contain zinc plated square nuts and bolts. ¹ Nickel-plated dome head bolts continued in Aero outfits until 1941. Nickel-plated nuts and bolts did not exist in the 1960s – brass nuts and bolts continued into the silver/yellow/black era until they were replaced by zinc plated bolts. Total number of messages on this page: 23. This is page 1 of 4. Variations & Oddities: I have at least one bolt, thread rolled but no slot cut, as well as one entirely blank - no thread rolled, no slot cut. I have recently acquired a mixed lot of Meccano which contains many difference kinds of nuts and bolts but I have 20 bolts and 40 nuts which are solid brass i.e non- magnetic and brass coloured but the nuts are square. What era did these come from? I have just opened my old box of childhood meccano for my son to play with. Everything is in perfect condition except that all of the '37' brass nuts and bolts are missing! So frustrating! Are you able to help please? Would you be able to supply me with x100? If so, how much?